The below Flea and Farmers Market Finder and Guide includes specific information for over 5,000 GreenMarkets and public markets located across the United States. I created this market directory and tips guide to help you locate more of your local markets since they are great places for eco-friendly frugal fun shopping. These Flea and Farmers Markets, besides being great places to save lots of money on all your household needs, are wonderfully diverse and interesting places. They are carnivals for the senses - full of unique smells, sights, and sounds. No two markets are alike, and each will have a unique ambience and character that is formed by the colorful local vendors from your community. Local markets are great places to meet your extended neighbors and become part of your local community. Where else can you go to not only buy locally grown organic food, but also get to know the local farmers who grew it and directly support them and their small farms plus your local economy? Your state's public markets, besides being rich cultural hotspots, are often the best sources of frugal deals and bargains on not only mainstream items, but also many other oddities and local treasures you will never find elsewhere. You never know what you might find and that is a big part of the fun of shopping regularly at your local flea and farmers markets. Shopping your local Farmers Market regularly for your day to day needs is one of the most effective ways to make an easy frugal living, to support your local economy, and to help foster environmental stewardship and a sustainable future. To help you get the most out of your local market excursions, I've compiled a list of Farmers Market shopping tips and tricks below. These shopping tips and tricks are based on my lifelong experience as an avid market goer on several continents. If you have any shopping tips and tricks of your own, please share them via the contact link below. 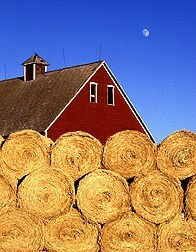 To find which of these markets is in your own backyard, click your Country, State, Territory or Commonwealth to see your locally targeted list having: State Farmers Market names, addresses, contact information, accepted forms of payment, whether it's covered or not, and Farmers Market operating schedules. Note: This is a new, extensive, and growing feature to Frugalicity.com, so as time allows more state and country links will be "going live". Anyone who professes to be frugal should know that these public markets offer a treasure trove of deals, a Mecca for bargain-hunting, and a paradise of frugal shopping. Make time to visit your local markets at least a few times a month. The more frequently you go, the merrier you will be because it is good for your finances, health, and soul. As you can see from the below farmers market growth chart there are now over 7,100 farmers markets in the United States, with a 17% rate of growth just in the last two years. Notice the pick up in growth rate since the financial crisis quickened in late 2008. There was a similar, but lesser, effect after the September 11, 2001 attacks and during the multi-year recession that followed. The tougher the times, the more people shop at farmers markets. This latest and steapest growth spurt reflects the widespread need for most everyone to start saving money, so more people have started looking toward frugality and buying cheaper, healthier local food. This growing desire for getting back to the basics has spurred demand for new farmers markets like never before. This is a very healthy trend for us all...except maybe corporate owned factory farms and the big box Franken-food stores. Fruits of Our Labors or Grapes of Wrath? With your help, I intend to grow this into the largest directory of worldwide Public Markets online. ...or any other type of public market you would like to see added. With your help, the fruits of our labor will create win/win situations for a lot of other frugal-minded visitors from all over the world who may be searching for cheap and eco-friendly sources of locally-grown fresh produce, organic foods, or other local delicacies and specialties. By helping more people find local sources of high quality sustainably grown organic food, you will help to support local economies and fight the problem known as "food sprawl" and all the problems that go along with trucking our food in from highly eco-UNfriendly factory farms thousands of miles away via fossil fuel burning trucks, trains, planes, and ships. I also encourage you to "pay it forward" and spread the word about the benefits and convenience of your local Flea Markets and Farmers Markets. Introduce a friend, neighbor, or family member to the joys of local Flea Market shopping and you'll be helping to change the well-entrenched supermarket mentality that has the masses assuming that quick, cheap, and convenient goods come only from the big box retailers. This wrong-minded "group think" contributes greatly to all the "out of sight, out of mind" consequences resulting from all the "stuff" we buy daily. Changing this mentality is "a tough row to hoe" indeed! But YES WE CAN change the world for the better by starting in our own backyards and neighborhoods. Small local actions can quickly equal large collective impacts, positive OR negative. It's up to each one of us to vote with our dollars. And you can help others to find this Farmers Market Directory by clicking the "share" buttons at the bottom of this page. Increasingly, people are discovering the bonanzas of savings, sustainability, and fun found right in their own backyards, especially as the global economic crisis deepens. Through fiscal necessity and uncertainty about food quality, growing numbers of people are learning that Flea Markets and Farmers Markets often offer goods that are just as fast, cheap, and convenient as the big box retailers - yet often with better quality, selection, and freshness to boot. And there are many other far-reaching societal benefits that result when you shop regularly at your local markets. I've outline many of these benefits below. One bag of tomatoes, some sweet potatoes, and a chotchky or two and you'll quickly wish you had prepared ahead to bring some sort of market bag or wheeled shopping cart with you to the Farmers Market. Below are some of my suggestions for reusuable shopping tote bags and carts that will make your farmers market shopping a whole lot easier. See the two arrows below the images in the carousel? Use those arrows to rotate the carousel, and hover your cursor over each image if you would like to see a bigger image and get more information. The carts with liners are great because they keep your smaller veggies and fruits from falling through the sides or bottom. Also verify your shopping cart is light-weight and folds up to fit in your trunk, as many of the below carts are. I've noticed the more savvy and frugal Farmers Market goers here in the South usually have baby strollers for carrying their goodies at market. Baby strollers are actually a great idea because they are light weight, they roll, they can carry a lot, and they also fold up for easy storage in the trunk of a car. Now that's what I call "repurposing"! If you have any other Farmers Market products that have worked for you, please contact me via the link at the bottom of this page. Ask a lot of questions and dust off your polite haggling skills or bring a brash and savvy friend who enjoys the game of haggling with vendors. Also keep in mind that late deals can be had when vendors are about to pack up and leave for the day. Walk the Walk: Wear a comfortable pair of shoes. You'll be doing a lot of walking while carrying your flea market finds, and many flea markets seemingly go on for miles. Take Your Sweet Time: First-time Farmers Market goers are often overwhelmed by all the sensory feedback upon arrival. If you are new to the market you may first want to make a loop through the entire market before you start to buy, that way you get acclimated to your surroundings and know better what's available and where. Don't just jump at the first vendor selling what you need. Others will likely have it cheaper elsewhere. Bring extra tote bags / wagon / kitchen cart / garden basket / (an energetic kid) / or a stroller to make it easier to carry your frugal finds (for ideas see products above). Many vendors do supply cheap plastic bags, but you should bring your own reusable string or cloth tote bags with handles and some kind of wheeled carrier for the most environmentally friendly and convenient solution for you. Brave the Elements: Prepare for the weather. You may want to bring sunscreen, cool drinks, sunglasses, hat, or umbrella. Many Flea Markets aren't covered. 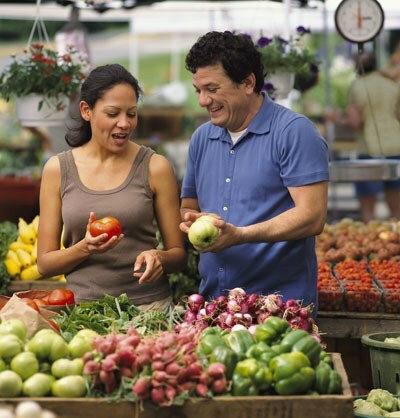 The above Farmers Market Finder will tell you whether the market is covered or not. Chill Out! You may want to keep a cooler with ice packs in your trunk, depending on what you purchase, the time of year, and how far away from home you are. Keep in mind that Potatoes, Garlic, Tomatoes, and Onions should ALWAYS be stored at room temperature. Don't be afraid to ask the farmer or vendor how to best store produce once you get it home. 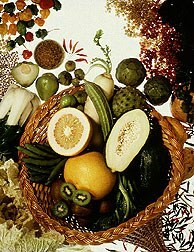 They often will give hints and tips on how to best prepare or cook fruits and vegetables too. For the best selection plan to Arrive early. 7:00 am - 8:00 am is usually best (but check local market schedules via the Farmers Market Finder above). Late Bird Gets the Worm Too Sometimes: Late deals can be had, but it could be on "slim pickin's". I've actually gotten free or almost free produce, books, ect when vendors where packing up and ready to leave after not being able to sell their remaining odds and ends. Many market vendors are one-time sellers who have just rented a booth for $5 or $10 for a day so they can clear out some clutter or just try to raise a little cash fast by selling home-grown vegies or any other surplus they have. They are happy to make a late sale usually. Just keep in mind that there is often a trade-off in selection late in the day and many vendors may be completely sold out of what you want if you wait too late. Experiment: Farmers Markets are great places to discover new, fresh, and exotic things you may never have known existed. And the vendors often have great recipe ideas and tips on how to get the most out of these new discoveries. 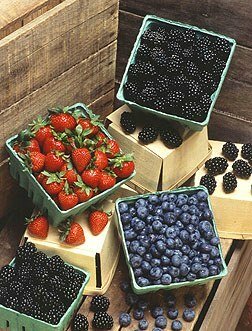 It is likely you will find new flower varieties, special seasonal local harvests like sourwood honey, local organic delicacies like freshly picked strawberries (or Muscadines here in the South), homemade products like Chow Chow and pepper jelly, and heirloom varieties of vegetables you would never be able to find at the big box retail chains. Comp Shop for Bulk Bargains: Most Farmers Markets have some competition between vendors who are selling the same items. Often you can get a vendor with a better quality of product but higher price to drop their prices to match the price of a lower priced neighboring vendor who is trying to sell the same or similar product, but of lower quality. For example: If one guy is selling Pablano Peppers 2 for a $1 and they are spotless, but a nearby vendor is selling their shriveled Pablano Peppers at 4 for $1, try asking the better quality vendor to give you a break in light of the cheaper competition. This gives you some haggling leverage, and afterall, it doesn't hurt to ask. I've gotten many bargains this way, especially if I promise a larger volume sale to the superior vendor. Bottom line, if you buy in bulk don't be reluctant to ask for a bargain deal. Cash is King: Many flea market vendors only accept cash, so be sure to bring some greenback dollars with you. The above Flea Market Finder will also tell you what payment options your local markets typically accept. Some market vendors participate in Federal food programs as well. East of Eden: Keep in mind that the Farmers Markets in more rural areas, far away from major metro areas, tend to have cheaper prices and better bargains. In bustling cities and their surrounding upscale neighborhoods you will notice that the local markets reflect the tastes and price points that the local "gentrified citizenry" can afford. The more "uppidy" the area, the more uppidy the prices. The out of the way markets offer the best deals generally speaking. I've seen many markets that have sections for selling pets or farm animals. The cute puppy section is always a popular area of any Flea Market, but be aware that the puppies may come from "puppy mills" where they are often raised in large numbers inhumanely. Animals may also carry diseases like Parvo Virus which can be fatal to pets. Be sure and wash your hands if you handle any animals at the markets. Live Dangerously? Local Health Department regulations may forbid or restrict the sale of "processed or manufactured" items like: baked breads, pies, cookies, jams, jellies, pickles, eggs, homemade cheese, fresh meat, and home canned foods. You may want to avoid or use extra discretion with these items for safety reasons since you don't know under what conditions of cleanliness they were produced. How many cases of food poisoning, Hepatitis, or Salmonella outbreaks were traced back to Flea Market food stuffs? Probably quite a few. Gypsies, Tramps, and Thieves: There have been many flea market busts involving "gypsy rings" and stolen merchandise from discount chains such as from Wal-Mart, K-Mart, Lowes, or Home Depot. In my early "Wally World" days, I helped the Loss Prevention Department bust a lot of these unscrupulous jokers. They would go from chain to chain all day long, stealing what they could in bulk. 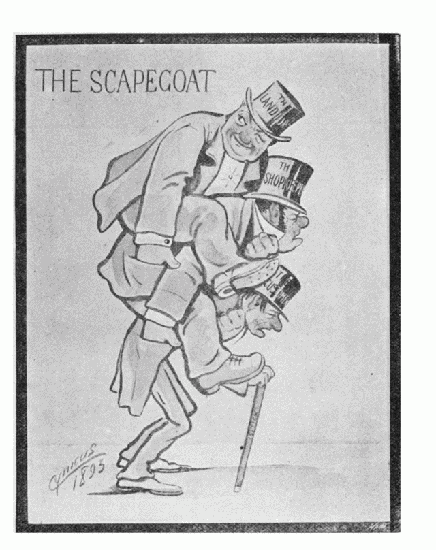 We called them "gypsy gangs" because they were nomadic gangs of professional shoplifters and Grifters traveling in packs of sometimes 10 or more people. At the market the stolen items would often still have the store's old pink or green Garvey Gun price stickers on them (though some of this Flea Market merchandise may have just been bought on clearance and just resold at the Flea Market - a common occurance). There have also been many Flea Market sting operations and arrests involving "bootlegged" and "pirated" brand-name merchandise like dvd movies, music cd's, designer pocketbooks, software, and clothing. And buyer beware, especially with regards to pharmaceuticals, over-the-counter medications, or other processed household beauty or consumable items. I've seen many items at Farmers' Markets that appeared to have been repackaged, tampered with, knock-offs, stolen, outdated, or damaged. It's amazing what some people will buy...and sell! Pick a Pack of Pockets Full of Possies: Speaking of thieves... In the more urban street markets, big city Flea Markets, and crowded Swap Meets always be aware that pick pockets may be on the prowl and intent on pinching your "pocket full of sunshine". They sometimes work in teams and some of the best pick pockets, such as in New York's open air markets for example, are homeless children living on the streets who were taught how to pick pockets before they could say their ABC's. Be Aware Always: Many pick pockets are as nimble as magicians when it comes to the slight of hand of pick pocketing. The best are like ghosts and can pinch a wallet with the greatest of ease. 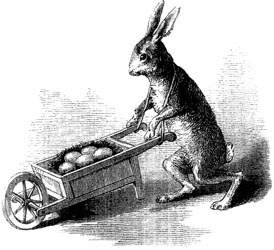 And like the magician, they often have an assistant (accomplice) helping them with the trick too. If someone seemingly accidentally bumps into you or drops loose items next to you, be aware that it may be a diliberate attempt to "redirect" your attention so their partner can simultaneously swoop in and pick your pocket. Sometimes there is a third "pass off" person involved. The pick pocketer immediately passes the stolen item off to this third "receiver". So if the actual pick pocket gets caught or attracts suspicion, the wallet or purse won't be found in their possession but will have been "stolen away" fast by the third accomplice. So, keep in mind that wherever there are lots of people with something to take, there will always be "opportunists" looking to take it. Don't carry a purse or handbag and don't put your wallet in your back pocket unless you do like many hardy souls (and Hell's Angels) here in the South and chain it to your hip, lol. Your front pockets or a fanny pack strapped around your waste for carrying your money may be a good idea. Bottom line: Though they are likely few and far between, don't get burned by the market going Matchstick men! Uncle Sam and His Revenuers: Speaking of getting your pocket picked...keep in mind that Sales tax must usually be collected on all items sold by persons who did not produce them. But farmer-raised and owned, raw agricultural products grown by the seller are usually tax free. So sales tax savings is yet another reason you can save money by shopping at your local Farmers Market. Kid Power: Despite the above warnings about the occasional crime elements at markets, don't underestimate how enjoyable open-air markets can be as a safe and socially redeaming family outing. Your little rug rats will likely love going with you to the Flea Market. There's usually many distractions the kids will enjoy. And Farmers Markets have a way of getting children interested in fresh fruits and vegetables and the healthy meals that result from them. So don't forget to involve the kids! And of course you can put them to work by letting them help you carry your market finds;^} (I wish I had a dollar for every 50lb. bag of potatoes I hauled across the nearby Pickens Flea Market and Anderson Jockey Lot when I was a "young'ne"). What better way for frugal parents to teach their kids the valuable connection between work ethic, economy, community, and character than by taking them shopping at the local Farmer's Market. Sure beats them vegging out in front of the TV or computer. As the recent U.S. Gov ad campaign jingle says, "Get up...Get up...Get up....Feel Better!" Indeed! When they learn to earn their keep early on, your children will be more responcible, independant, and conscientious. Don't spoil them by shielding them from a little manual labor. I guarantee that after a few hours of intensive shopping at your local Farmers Market, any hyperactive kid will want a nap. New Online Flea Markets, or Virtual Flea Markets as they are sometimes called, are a popular and rapidly growing advent of the flurishing Information Superhighway. These diverse online markets usually offer a safe, regulated, organized, and convenient place where Flea Market Vendors and livingroom market goers can come together on a global basis and in the comfort of their own homes. And best of all there's no need to hunt for a parking space, there's little or no "carbon footprint" produced by shopping at online Flea Markets, and you don't have to walk for miles while lugging around canvas bags full of your Flea Market finds. Unlike their highly popular, but more dilute and beaurocratic precursors - like Craigslist, EBAY, and Alibaba - the pure-play Online Flea Markets are often easier to navigate, cheaper for vendors to sell on, and less cluttered with so-called dog-eat-dog "Powersellers", Importers, Wholesalers, and Drop Shippers. And they often offer more high quality handmade, one-of-a-kind, personalized mom-and-pop type items that aren't offered anywhere else. Know the rules of the game. Be sure to read through the rules, policies, warranties, or legal terms not only for the market vendors, but also for the overall Online Flea Market website. Ignoring the small print can cost you. Recordkeeping is a good idea when completing online transactions. You should consider printing out the legal terms, warranties, item details, confirmation emails, item description, guarantee of authenticity, and any other pertinent records related to your online purchase. Make sure they are dated as well. Notify the seller immediately in writing if you are not happy with your purchase after you receive it. This is where the Legal Terms become especially important since repairs or refunds involve specific procedures you must follow. As above, make copies of all communications and documents related to any repair or refund. Make sure you have the latest "refreshed" information on your monitor screen. Sometimes browsers "cache" pages that are accessed frequently and thus the page information may have changed since last you viewed it, but unless you use your browser's "refresh" or "reload" function, you might not know it. These functions can be found under the "view" menu at the top of your browser's window. Hitting reload or refresh will call the most updated page up. Go with your gut feelings and trust your instincts. If you feel pressured or uncomfortable about an Online Flea Market vendor or have unanswered questions about bidding or buying an item, it might be a good idea to hold off of making the purchase. Evaluate the Seller's Credibility. Are they an authroized seller by the manufacturer? What is their reputation? Some Online Flea Market sites offer seller ratings, feedback, and reviews so you can see what other flea market goers thought about the quality of the seller. You may also want to make sure the seller has more than just a web address through which they can be contacted. Try to get their business address and phone number and always be weary if a seller offers only a P.O. box address. And be aware that you may not have the same legal rights or ability to enforce your rights if the seller is based in another country. So be extra cautious if a market vendor is based outside of the U.S.
You may want to preselect vendors and sellers. Look for vendors and businesses already qualified under the BBBOnline's Reliability and Privacy Seals programs. If you have a complaint about your Flea Market merchandise look for a "customer service" page, email address, or phone number so you can ask your questions or communicate your complaint. There is nothing that says you can't ask for what you think is fair, even if it exceeds what the vendors policies promise. If the vendor wants to keep customers happy, you might be surprised how willing a seller is to "make it right". But if you are not satisfied with how the seller responds to your complaint, be aware that you can contact the Better Business Bureau, or the The Federal Trade Commission which has a consumer complaint form. Or you can contact the Office of the State Attorney General in your state or the state where the seller is located which you can find out through the National Association of Attorneys General. Know what you are getting for your money. Make sure to verify whether the item is new or used. Make sure if a price seems unusually low that the purchase is not too good to be true. There may be a reason it is much cheaper than all other market vendors online. And you should know that because you took the time to also shop around online and off, and so can detect whether the price is unusually low or not. Get the most bang for your buck. Again, shop around to be sure your aren't overpaying and watch out for the tendency to overbid in online auctions. Also be aware that some claims about products are just the vendor's opinion. For example, "this is the best radio-controlled car ever made". That's different than the vendor claiming the wing width is 36 inches long from tip to tip. Pay attention to subjective versus objective claims and the proof offered (or not) to back them up. Double check your order. Does your shopping cart have other items from earlier visits or is the quantity of item different than what you want? Some websites (like Amazon.com) having shopping cart functions that cookie your computer and remember items you may have previously added, yet may not still want to purchase. Use your plastic. The safest way to pay for your Online Flea Market finds is via credit card. Federal law limits your losses from fraudulent credit card transactions to $50. And credit card companies also often protect buyers via initiating charge backs on disputed charges that meet certain stipulations. All you have to do is call your credit card company if your are not happy with your purchase or if you suspect fraud. Consider shipping logistics. You might want to request the Online Flea Market vendor ship your item to your office or place of work if you won't be home when your item arrives and your don't trust your neighborhood. You can also request a "sign on delivery" shipment so the item won't be left at your front door while you aren't home. Also remember that some carriers will not deliver very heavy and bulky items to residential addresses (because a fork lift may be required for unloading and because the size of delivery truck may be prohibitive). The term "Flea Market" is widely believed to originate from reference to the most famous flea market in Paris. This market is known as Les Puces de Saint-Ouen, a.k.a. 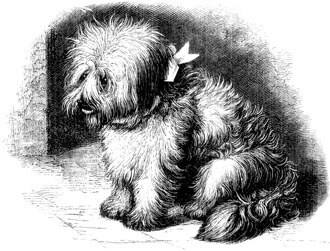 Les Puces (or "The Fleas"). It is located at Porte de Clignancourt and is the largest antiques market in the world. The original Flea Market, Les Puces, typically attracts almost 200,000 visitors each weekend and was started over two centuries ago by "rag and bone" men or "crocheteurs" (garbage pickers) who searched through the garbage for items they could resell. 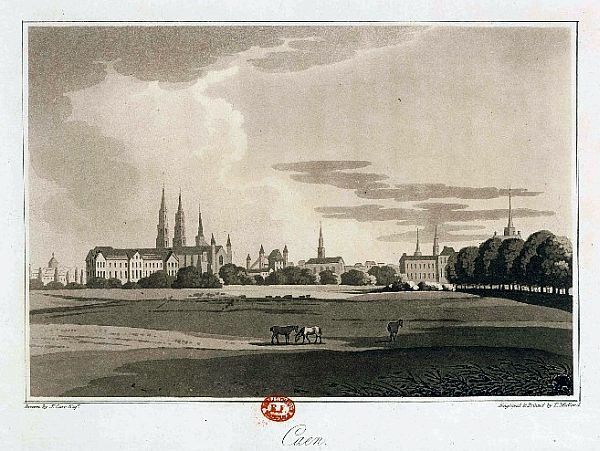 For this hopeful ambition, these peddlers of flea infested furniture and other delapidated urban detritis were thought to personify the romantic term pêcheurs de lune’, which means "fishermen for the moon". Have you ever thought about how much of the U.S. food supply has been "outsourced" to foreign countries? We now depend largely on imports of food from other countries with the tonnage of imported food having quadrupled in the last four decades. This increase has far outpaced the growth in population, so the trend of importing food is quickly growing. Quality control concerns aside, this is very alarming if you consider the highly wasteful, polluting, and convoluted system of growing, transport, storage, and distribution. And what would happen if a major catastrophe crippled major parts of the industrial food scheme as it stands today? Local food supplies are essential to national security and the sustainability of society. Bet you didn't know shopping at your local Farmers Market could contribute to "Homeland Security". Over 90% of farms in America earn less than $250,000 a year from their crops. And these small farm operations are the life blood of most Farmers' Markets, and visa versa, because many thousands of these local farms sell their entire output solely through their local Farmers Markets and they often make their entire annual incomes from local sales at market. So Farmers Markets are wonderful places to build one-on-one relationships with local growers and you will become an important benefactor in support of their viability as a small-farm operation. And don't underestimate how you can benefit from the wealth of knowledge they typically love to share. Small-scale Farmers are by necessity Naturalists and wise land stewards on a practical scale. Farmers often receive a premium price for their produce when it's sold at local Farmers' Markets as compared to selling to cut-throat commodities brokers and retail channels. However, prices for market-goers are still often significantly below retail because the convoluted distribution and marketing machine costs are usually cut out of the equation, and thus the savings are passed on to the market buyer. So Farmers Markets create a win/win situation for community, grower, and consumer. When you shop at your local Greenmarket (or Freshmarket as they are sometimes called) you are creating price support to commodities grown in a more environmentally friendly way than the big factory farms. Ultimately this helps retard development and the loss of productive land to urban sprawl, saves energy, and reduces greenhouse gas emmissions. Supermarket food often has been imported and transported from thousands of miles away to arrive at your dinner table. Eating all imported food means that you are eating food which likely requires the use of four times the energy to grow and which produces four times the greenhouse gas emmisions, as compared to the output of sustainably grown local small-farm operations. Greenmarkets really are GREEN! Food sold at your local Farmers Market is usually much fresher and healthier than the highly adulterated "FrankenFood" sold at your big box supermarket chains. A lot of produce can be bought at your local market just hours after it was fresh picked in the fields. There is no need for all the typical chemical treatments, modified atmosphere storage, high-fructose corn syrup preservation, or chlorine / ozonolysis / irradiation sanitization. Healthy whole foods without all the added detriment from processing is probably one of the biggest benefits to buying at your local Farmers Market. In the U.S. a lot of tax payer dollars goes toward government regulation of food quality, inventories, and appearance. This is because most large farm factories have no conscience towards social, environmental, and economic considerations for populations. Factory farm crops are largely "Monoculture", meaning they focus on a very limited portfolio of commodities. This makes them very aggresive in capitilizing on all loopholes and unregulated practices which will help them squeeze every last drop of production out of the land and thus maximize their bottom lines. The local small-farm grower can not afford to operate unsustainably like the greedy mega monoculture farms. The small-scale local farmer often has a triple bottom line which depends on their conscientious social, environmental, and ecomomic contribution. They have a big vested interest in doing the right thing and doing well. 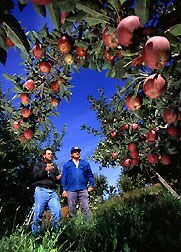 Whereas, corporate growers tend inherently toward unethically wasteful and unsustainable practices to benefit their bottom lines at the expense of people, hence the need for regulation, oversight, and watchdog groups. the people ultimately are left with the tab, especially in those far off lands where regulation is minimal or non-existant. Globalization has a very dark side, especially when you really take a close look at supermarket food and the convolutedly wasteful "Rube Goldberg-like" system from whence it came. Prime Example: The fragile rainforest biomes throughout Malaysia and Indonesia are currently being dessimated as multinational corporation-owned Palm Oil plantations quickly swallow up irreplaceable Tropical Rainforests. The demand is exploding as Palm Kernel Oil and Palm Oil becomes a popular cheap oil additive for household products, biofuel feedstocks, and foods (replacing trans fats). The exponential growth in Palm Oil Plantations is a serious crisis because they are rapidly destroying vaste swaths of land rich in biodiveristy. Palm Oil Plantations also severly pollute watersheds and endanger already rare animal species such as the Sumatran Tigers, Asian Rhinoceros, and Borneo Orangutans. So the next time you buy a product from a big box retailer which lists "sodium lauryl sulphate" as an ingredient (most of them do) just realize that you are contributing to the problem rather than contributing to the solution by buying locally-grown whole foods that don't involve Palm Oil additives. Conglomerate growers often undercut local economies by sucking profits out of the area and relocating it far abroad. This is done at the expense of the surrounding environment and sustains only low wage service jobs. Many locations are effectively held hostage to factory farm operations because they create a lack of diversity in the local job market and offer locals only low paying jobs with high seasonality, little job security, and often no or poor benefits. 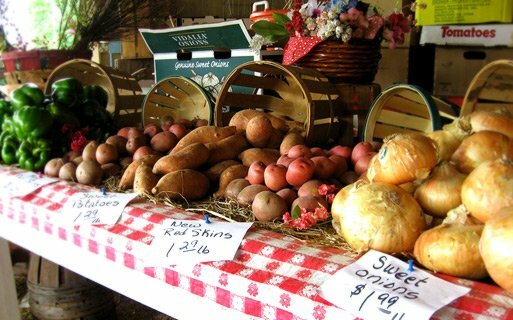 However, expenditures at local Farmers Markets means that your money usually stays and works locally to supports local families, neighborhoods, and municipalities - while creating diversity in the local business landscape by supporting the creation of jobs related to the creation, storage, and distribution of sustainably grown foods. Where a small-farm operation continues to thrive, a large conglomerates farm operation does not. By shopping at your local Farmers Market you can help stave off the trend toward mega-farm monocultures. One study among market goers in Pennsylvania, Virginia, and Tennessee showed that shoppers frequented farmers’ markets for the primary reasons of fresher, better quality produce, and also for cheaper prices, larger quantities, more variety, and simply because it was an enjoyable experience. Farmers’ markets appeal to all economic groups because marketing and distribution costs and other middle men are often cut out of the equation, resulting in significant savings to the consumer. And you get to meet face to face with the grower too. It's like that orange juice commercial where the Florida orange grower hands the carton of orange juice directly to the shopper. Except in the case of Farmers Markets it's as if he was dropping some extra coin from the "supply chain savings" in her other hand as well. Shopping at your local Farmers Market is a great way to "go green". By buying locally produced fruits, vegetables, and herbs you are helping to elliminate emmisions given off if the same amount of food you bought had been transported in from far away by fossil fuel-burning trucks, trains, planes, and ships. You are also supporting your local small farmer who likely has much more vested interest in practicing more Earth-friendly agricultural techniques and water and soil conservation practices as compared to the big factory farms with all their clear-cutting, errosion, pesticides, irrigation waste, and chemical fertilizer run-off. As of August 2008, there was a total of 4,685 Farmers Markets throughout the United States according to the USDA. That's 3,000 more than in 1994 and the numbers continue to grow as more people discover the wide variety of fresh and locally grown produce. Farmers Markets are healthy for the community because they encourage social interaction between urban, suburban, and rural citizens. And they also allow the opportunity for farmers and consumers to interact. They also make fresh nutritious foods available in areas where they otherwise wouldn't be, like some low income urban areas. And Farmers Markets also often foster wholesome eating habits and help to boost the economy of the community. Many Farmers Markets participate in food donation programs and support local anti-hunger initiatives. So needy individuals and families greatly benefit as well. The United States Department of Agriculture strongly supports the development, operation, and expansion of farmers markets because they are great for consumers and also for small-farm operations (which make up 94% of all farms in America). 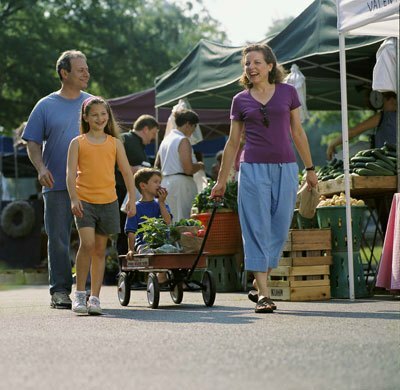 There are several federal programs and grants available for those who wish to start new Farmers' Markets such as: the Farmers Market Promotion Program (FMPP) and the Federal State Marketing Improvement Program (FSMIP). The USDS also supports many food assistant programs which allow and encourage food procurement at local Farmers Markets. Examples are the WIC: Women, Infants, and Children Program, Farmers Market Nutrition Program (FMNP), and the Seniors Farmers Market Nutrition Program (SFMNP). Many markets accept vouchers and payments offered through these federal food programs. For example, more and more markets are starting to accept Electronic Food Stamps (EBT cards). National Farmers Market Week in the U.S. is August 3-9. And it's no wonder, since this happens to be primetime for many of the best seasonal produce bargains in the U.S. The peak of harvest for this cornucopia of fresh organic food and in season treats is one of the best last hoorahs of summer you should learn to anticipate and enjoy. You'll learn to love these outdoor cornucopias for many other reasons as well. Farmers Markets are often like perpetual state or county fairs with all their sights, sounds, tastes, and smells. Besides being entertaining, you will do yourself and your neighbors a big favor by visiting your local flea market regularly because it means you are contributing to the sustainability of your community, and that too makes for a fun and rewarding feeling. Flea markets are not only a feast for your senses, but they usually also offer the best seasonal bargains and a direct way to support your local community of farmers and vendors, which provides jobs and income to families in the area. So by buying local, like the local farmer, you too are helping to cultivate a healthy community. My two favorite local upstate South Carolina flea markets, the Pickens Flea Market and the Anderson Jockey Lot, are wonderful places to find huge bargains on regional fruits and vegetables from local growers (a very popular seasonal example here being sweet Vidalia Onions). There are always many other cheap deals as well and the changing seasons bring an ever-changing menu of local delacacies and harvests. The ambience of local markets reflects the ambiance of the surrounding neighborhoods and cultures of the indigenous populations. This means that all markets have their own unique personality and look and feel depending on who and what is nearby. 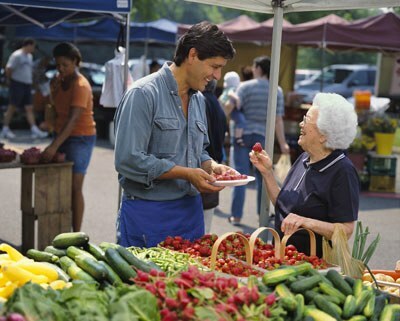 Many Farmer's Markets are very popular attractions which draw people from far and wide. For example, the Anderson Jockey Lot here in Upstate South Carolina was the #1 attraction in South Carolina last year with several million visitors according to SC state tourism agency findings. Outdoor markets are magnets for colorful local personalities, both young and old. So your local market is probably one of the best places for people watching. Local markets are usually great places for a family outings as well and market going is probably one of the healthiest and best forms of free entertainment you will find. So why not make a family tradition of having a weekly "market day", just like in the good ol' days? Talk about quality time with the family. There is no television involved, a little physical activity is required, and you get to kill several birds (like the otherwise drudgerous task of shopping) with one stone. And Flea and Farmers markets are like carnivals for the senses and will offer something of interest for every member of your family. Do you know of a Flea Market / Farmer's Market / Green Market / Swapmeet / or Freshmarket that was not listed under your state in the above list? Or do you have any Flea Market shopping tips or tricks, or any other Frugal Living Tips or Home-made Recipes? Or maybe you have a suggestion or Frugal living question for us? If so, we'd love to hear from you. We invite you to ask, tell, and excel here on our Contact Page.